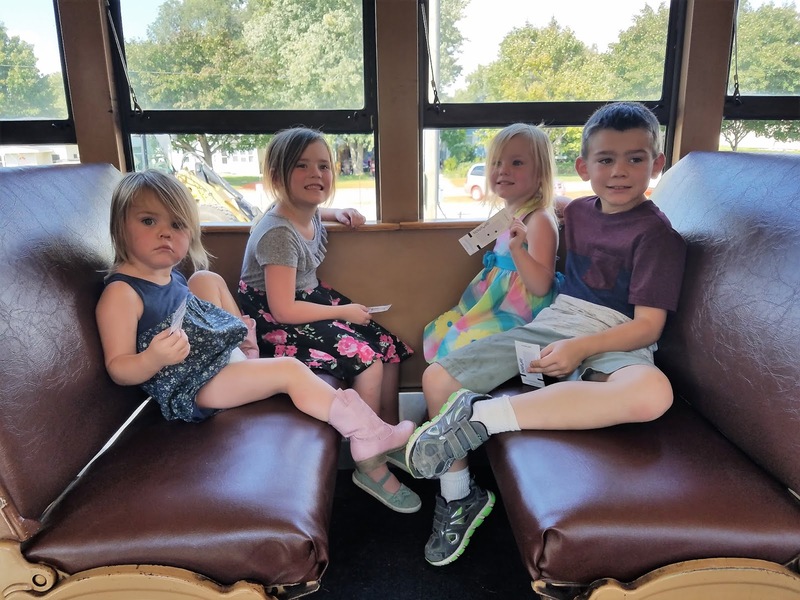 Our family had a great time traveling to the Boone & Scenic Valley Railroad to partake in the first weekend of the Day Out with Thomas tour. 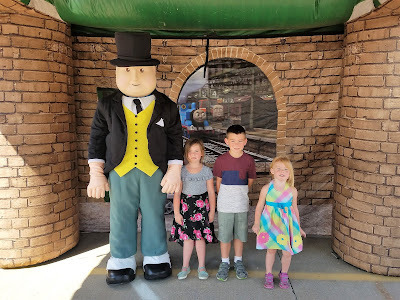 We have rode the train in Boone several times over the years with the kids and have even been to the Day Out with Thomas experience a couple other times with our oldest Mr. K when he was two and three years old. So it was a lot of fun to bring the girls this time and to see Thomas again since it had been a few years since our last visit. 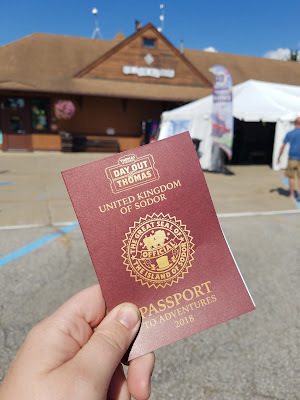 Grab a United Kingdom of Sodor Passport to Adventures booklet at the Will Call and Ticket Pick-Up Tent. This passport is perfect for your little engineers and takes them around to four different locations where they will get passport stamps. After they have collected all four stamps, they can return to the Ticket Tent to receive a prize, which this year is a bouncy Thomas ball. There are also some games and activities in the Passport Book too. Catch a ride on Thomas the Train! The train departs every hour on the hour and the ride lasts for about 25 minutes. If you have never been on a train ride in Boone before, an extra tip is that the seat backs can be pushed frontwards and backwards so you can have two benches facing each other (as seen below). While on the ride be sure to say hi to the Conductor who walks through every train car, and after your ride wave at the Engineer who is driving Thomas. There are also some photo opportunities in front of Thomas after you get off the train. 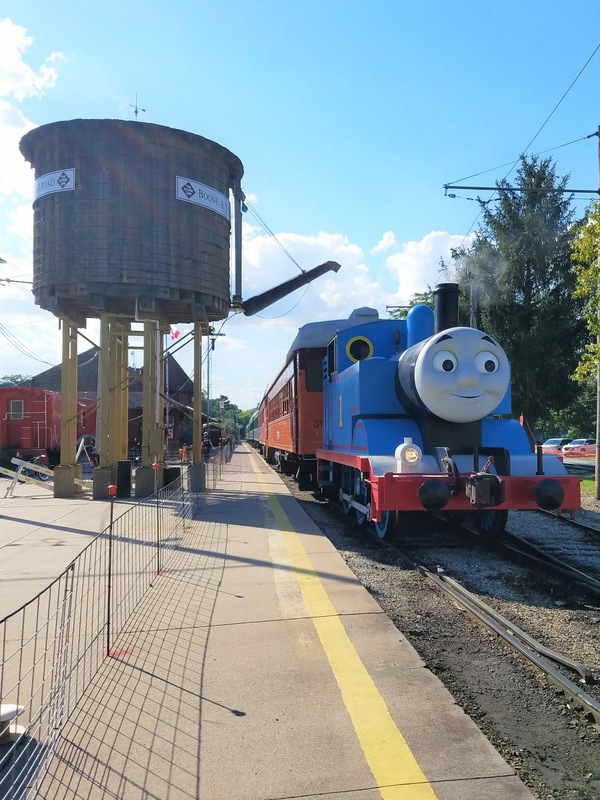 Besides riding the train, be sure to watch Thomas the Train depart the station either the ride before or after your trip. Our kids were fascinated seeing the #1 Engine leave the station. The Thomas engine's eyes and mouth moves and he talks before leaving on each trip. 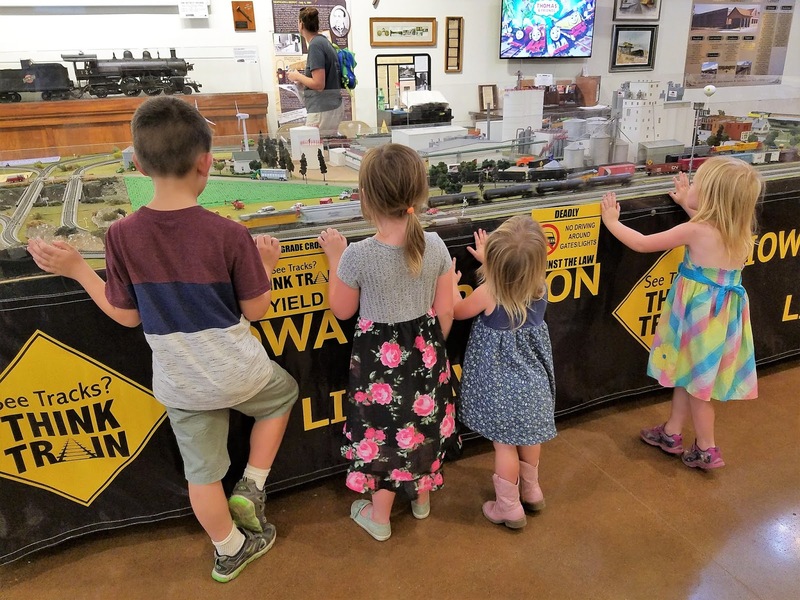 Explore the James H. Andrew Railroad Museum while you're on your Day Out with Thomas. With the purchase of your train tickets, you get complimentary admission into the museum. The Railroad Museum opened in 2012 and has a large collection of railroad artifacts and exhibits. 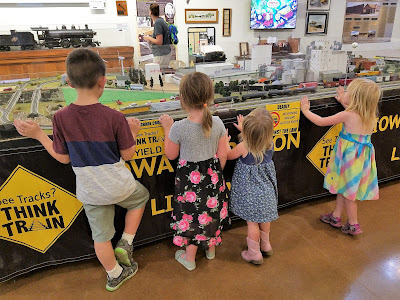 Our kids loved checking out all of the model train displays while we were there. Relax while the kids play in the Imagination Station and Inflatables, and while they watch a Magic Show or listen to the Musician. 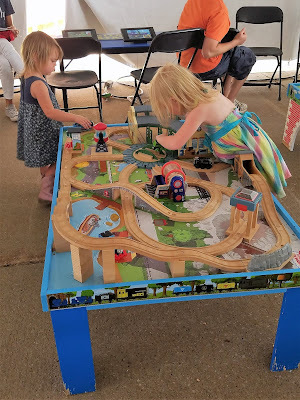 The Imagination Station is filled with toy trains, games, a coloring area and more. It is a great place for your kids to play, while you take a seat in one of the many chairs located around the outside of the tent. There are also sitting areas near the Inflatables and in the tent that has a Magician and a Musician. Bring your camera! There are tons of photo opportunities while you're on your Day Out with Thomas. Besides taking your picture with Thomas, you can take your picture with Sir Topham Hatt, on your train ride, on the stationary train car exhibits and more. So make your plans to attend Day Out with Thomas this weekend at the Boone & Scenic Valley Railroad. The event is open 1 p.m. to 5 p.m. on Friday, September 21st, 9 a.m. to 5 p.m. on Saturday, September 22nd, and 10 a.m. to 4 p.m. on Sunday, September 23rd. Tickets are $19 per person (ages 2 and up) and can be purchased ahead of time. Some train times do sell out so buying ahead of time is recommended. There is parking available in nearby lots and on the street. We would recommend planning an hour and a half to two hours at the railroad to be able to experience everything. And if you enjoy your visit this weekend, I encourage you to come back and go on another ride on the Boone & Scenic Valley Railroad. Our kids love going on the Fraser Train. You should also check out their Pumpkin Express in October and their Santa Express in November and December. 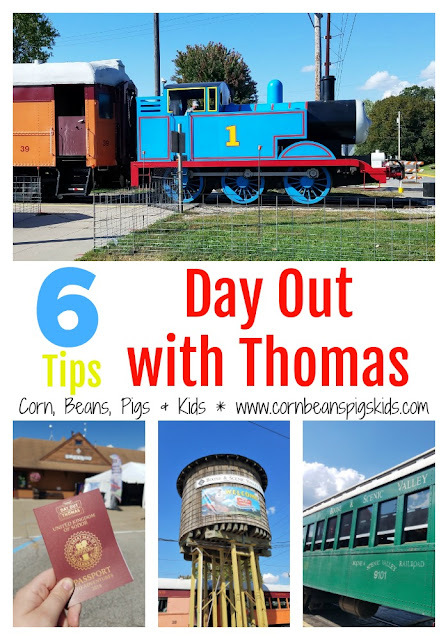 What tip did you like best from our Day Out with Thomas experience? Do you have anymore tips to add? Remember to Comment for a Cause! My son Hudson would love this! He loves thomas the train! Love meeting fellow train lovers! My son Oliver would love this! Thank you for the chance to win! Your welcome! Thanks for signing up for the giveaway! That looks like so much fun. Little Dude is a train lover and would think this is so cool! The tour goes all across the US and Canada. We'll see who the lucky winner is tomorrow but you can still reserve tickets for this weekend. The Day Out with Thomas tour usually comes to Boone mid-September every year. Of course I would take my kids! They are 8 and 4, and even though my 8-year old thinks he's too big for Thomas, he'd be all over the train ride! That's how my 7 year old was but he really enjoyed it! My 4yr old son would really love this. He has a great uncle that used to work on a railroad down south and gave him a special key for the tracks.He loves seeing and hearing trains. I would love to be able to take him along with grammy and papa. Sounds like an awesome aunt/nephew day!! You would definitely be in cool aunt status if you took them! My grandchildren love Thomas ! All of my kids have loved Thomas too. This looks like so much fun. The kids are adorable! Thanks Jeni! We had a great time! Thanks for sharing these all amazing tips of travel, i will also follow these all tips while travelling with my children's. This is a really good information thanks for sharing this important information with us. you are doing really great work.